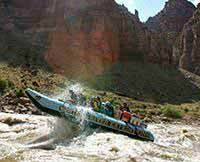 Cataract Canyon Express Was a Great Experience! The Cataract Express was pretty good. The Colorado River water levels were higher than I'd experienced before and the type of boats made the rapids experience quite unique. The smaller group on a Cataract Express is good. All in all, it was a great experience, up to Western standards for everything.